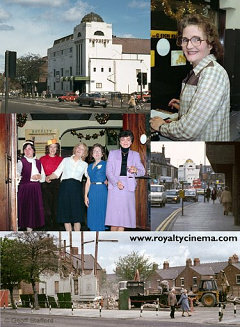 It's 37 years years since the Royalty cinema in Gosforth closed its doors for the final time, on 30 December 1981. You can post your memories of the Royalty. Meet some of the staff and visit the cinema during its final days, in the documentary Last Reel at the Royalty. The video runs for 27 minutes and is split into four parts here. Introduction and brief history. The doors open and manageress Henrietta Eastlake explains why the cinema is closing. The film comes to an end and some of the customers give their views. What happened to the Royalty next? The original VHS master footage was transferred to a digital video format. For the first time it could be edited without any loss of quality. Professional tools were used to clean up and colour correct the shots and mix the sound. The film has never looked or sounded better and includes some shots that haven't been seen before. The beginning of the 1980s was a bleak time for Britain's cinemas and its film industry. Cinema admissions had been in decline for a couple of decades (eventually they hit an all-time low in 1984) and the oil crisis of the 1970s had pushed up running costs. The home video-recorder was big news and no one knew what impact it would have on cinemas in the future. In 1981, the British film industry made only 24 movies — the lowest figure since 1914 and one quarter of the number that had been made just two years earlier. So, it was against this background that many cinemas like the Royalty pondered their future and looked for possible alternatives. Cinema World - a gallery of 433 images of cinemas on the photo-sharing site Flickr. Kencta's Photos - more than 700 photos of cinemas around the world on the photo-sharing site Flickr. September 2018 — although the website doesn't look much different it has been re-coded completely. This is so that it displays nicely on phone and tablet screens, as well as a desktop computer. If you spot anything amiss on your device please let us know. 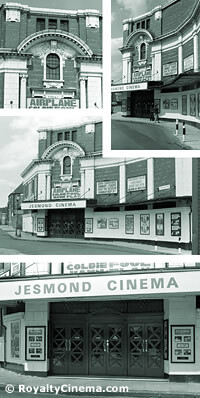 The much-loved Jesmond Picture House was demolished in Autumn 2009. Read more.